When making preserves, it is important to properly sterilise the jars and lids you are using. 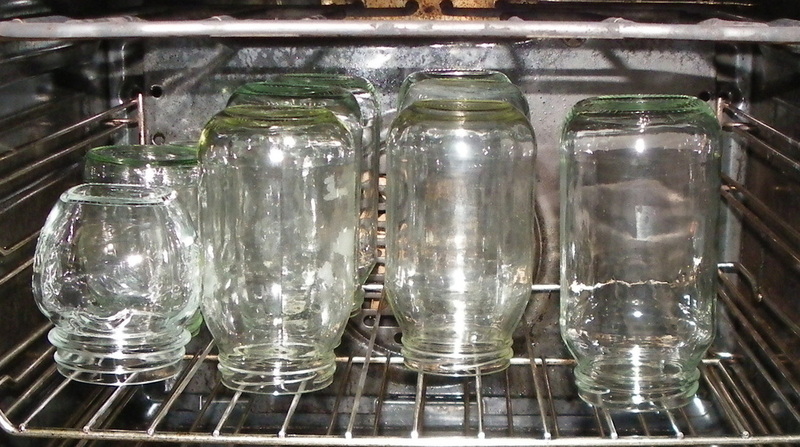 Poorly sterilised jars and lids may result in mould or other infections in your preserves. Put the jars into the oven on the rack, upside-down. Heat the jars at 150°C for at least 20 minutes (while you are cooking your preserves). Remove from oven while still hot (careful, they will be very hot - USE OVEN MITS), and fill with HOT jam or chutney. I put my jars (open end up) onto a thick newspaper to protect the counter from the heat. Screw the sterilised lids on tightly, after a few minutes but while the jam is still hot, to complete the process. Handle the jars with oven mits to avoid burn injuries. Note - this method is suitable only for metal lids. Place the lids into a pot and cover with water. Bring to the boil, cover and boil gently for at least 10 minutes. Be careful not to touch your fingers onto the insides of the lids. Use metal tongs to handle the lids. I also use this method to sterilise my metal measuring jug, which I use to pour the hot jam into the jars. 1. Only put hot jam into hot jars, to avoid glass breakage. Never put cold jam into hot jars. 2. Remove all labels from your jars before sterilising. 3. Use oven mitts to handle the jars and metal tongs to handle the lids. 4. Protect your counter-top from the heat with thick newspaper or heat proof mats. 5. Leave the jars in the oven until the preserves are ready.